Siemens, one of Germany’s largest manufacturing company,unveiled on Thursday plans to open a technology center in Ethiopia. The Company’s CEO, Joe Kaeser, disclosed the plan during a meeting with Getahun Mekuria, Ethiopia’s Innovation and Technology Minister, in Addis Ababa, Ethiopia. 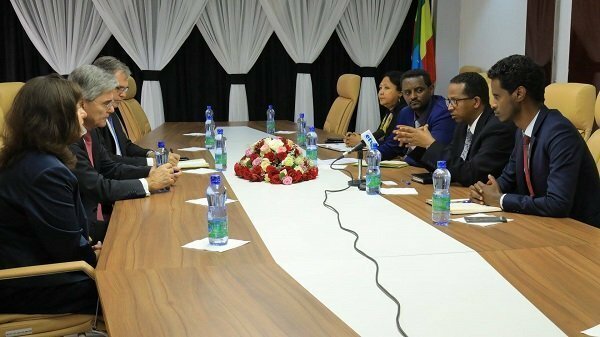 Based on a report from state media, his visit to Ethiopia came after the Ethiopian government requested Economic Delegates from Germany to build a technology center in Ethiopia. If it happens, it is going to the second Deutschland investment interest in Ethiopia. Towards the end of January this year, German automaker Volkswagen signed a memorandum of understanding with Ethiopian authorities about is intended investment plan in Ethiopia in the Presence of German President Frank-Walter Steinmeier who was on official visit to Ethiopia.